Police have used tear gas and baton charges to break up demonstrations by Pakistani lawyers against the country's state of emergency. Lawyers said many colleagues were arrested as protests were dispersed in Lahore, Karachi and Rawalpindi. The Islamic party Jamaat-e-Islami was also targeted, saying hundreds of its members were arrested overnight. President Pervez Musharraf declared the emergency on Saturday, saying he was acting to curb extremism. Critics, however, believe General Musharraf was acting to pre-empt a judgment by the Supreme Court on whether his re-election last month was legal. In Lahore an estimated 2,000 people congregated to stage a rally, but several were reported wounded when police waded in. "Police lobbed more than a dozen tear gas shells at lawyers who had gathered in the High Court and then beat them with batons," Sheikh Faisal, a lawyer at the court, told the AFP news agency by telephone. In Karachi police blocked off routes to the home of provincial Chief Justice Sabihuddin Ahmed, where protesting lawyers and judges had planned to gather before heading to the High Court. He told the BBC he had not been formally put under house arrest, "but when I started for my office, they told me I couldn't leave my house". 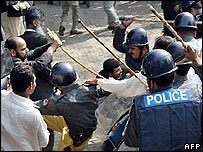 When lawyers arrived at the court and started chanting anti-Musharraf slogans, police moved in, swinging batons and dragging protesters into police vans, says the BBC's Ilyas Khan in Karachi. Police also "mercilessly beat" half a dozen lawyers who were chanting anti-government slogans at a court in the city of Rawalpindi, lawyer Mudassir Saeed told AFP. Lawyers' associations across the country said they were calling three days of protests and boycotts of courts. Media reports, citing police and interior ministry sources, said around 1,500 people had been arrested in the last 48 hours, while many top judges were effectively under house arrest. Responding to reports of the crackdown on Jamaat-e-Islami, Information Minister Tariq Azim described the claim of hundreds of detentions as an exaggeration. He told the BBC that it was up to protesters to remain calm, or deal with the consequences. "If people take law into their [own] hands, obviously, they have to be dealt with," he told The World Today. Pakistani TV news channels, which have huge audiences, are being prevented from broadcasting within the country, and at least one newspaper press was raided by police. Among the rumours swirling during the broadcasting blackout was one that President Musharraf himself had been put under house arrest by subordinates, but this was strenuously denied by the government. The US has suspended defence co-operation talks with Pakistan set for this week, and says it will review its multi-billion dollar aid programme. Top US officials have acknowledged Pakistan's key role as an ally in the "war on terror". But Secretary of State Condoleezza Rice said it was imperative for Pakistan "to quickly return to a constitutional path and then to hold elections". She urged Gen Musharraf to "take off his uniform" and return to civilian rule. Mr Azim said the issue of whether Gen Musharraf would step down as army chief was now "in limbo". The UK, another major donor, says it is examining whether the emergency will affect its aid to Pakistan. A spokesman for Prime Minister Gordon Brown urged Pakistan to restore "normal democratic and constitutional processes". The Pakistani government has suggested parliamentary polls scheduled for January could be delayed by up to a year. Prime Minister Shaukat Aziz said the emergency would last for "as long as is necessary". Gen Musharraf said he declared the emergency to stop Pakistan "committing suicide", because the country was in a crisis caused by militant violence and an unruly judiciary. Fears had been growing in the government that the Supreme Court could rule against Gen Musharraf over his eligibility to run for re-election. Benazir Bhutto, a political rival who has been in power-sharing talks with the president, told US TV channel ABC News that many people believed the emergency was aimed at "stopping a court verdict that was coming against him". Ms Bhutto was due to hold talks with a close aide of Gen Musharraf later on Monday. The sacked chief justice, Iftikhar Muhammad Chaudhry, said Gen Musharraf's manoeuvre was "illegal, unconstitutional and against the orders of the Supreme Court".